This is a re-release of a recording which originally appeared in 1998 as part of the MusicMasters catalogue. Eliot Fisk has long been known as an arranger and performer of ‘alternative’ repertoire for guitar such as the Paganini violin Caprices (see review), George Rochburg’s Caprice Variations (see review), Vivaldi concertos and many more. I was attracted to this as with any combination of instruments which might give us some new angle or aspects on J.S. Bach. I like guitar and enjoy the harpsichord, but know how tricky it can be to match such instruments in terms of tuning and sonority. Strings plucked with quills inevitably have a sharper attack and more strident tone than the typically mellow guitar, so would the latter soften the former, or would it struggle in an unequal competition? 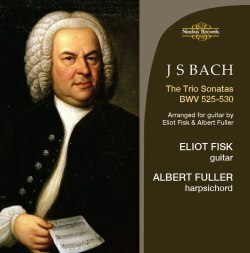 The ‘original’ trio sonatas were written with string instruments in mind, and with the harpsichord placed as a background continuo part the melodic lines can soar, the counterpoint can express busy conversational argument or regretful lament, and in the hands of a group like London Baroque on the BIS label (see review), the music has all the interest and many of the superb qualities of Bach’s concertos. This is not the case with these guitar and harpsichord arrangements, though from the start you wouldn’t expect the same kind of melodic qualities from two plucked-string instruments. The faster movements can sound exciting and punchy, but with a close harpsichord sound the guitar always has the feeling of playing catch-up in terms of dynamic. The harpsichord only has one dynamic, the guitar has many, and often dips in the balance so that Bach’s notes are blurred or missed. Rapid figurations and trills are easier on the keyboard than the fingerboard, so there’s another aspect in which the guitar is always playing second fiddle. This is not to diminish Eliot Fisk’s playing, just an observation about the unavoidable technical differences between these instruments. Technically these are good performances, if not musically very interesting. This aspect of the playing comes back to all of the problems touched on above, and I fear always will. The harpsichord is too strong all of the time; and neither instrument can do more than create the illusion of a legato line. The subtlety of the guitar is constantly trodden on by the relentless harpsichord, and the harpsichord is too significant a part in each arrangement to become an elegant support for its partner. Tuning is pretty good for the most part and there are moments where Bach shines a little brighter, such as in the spare texture of the opening Adagio of BWV 528, but this ultimately remains to my ears a tussle between unequal partners. Alas, this is an experiment which needed rethinking at an earlier stage than the results arising from this recording.